On 20 March 2003, a United States-led international coalition - which included Britain - launched an invasion of Iraq. The stated aims were to disarm the country of weapons of mass destruction, end Saddam Hussein's support for terrorism and free the Iraqi people from his repressive regime. 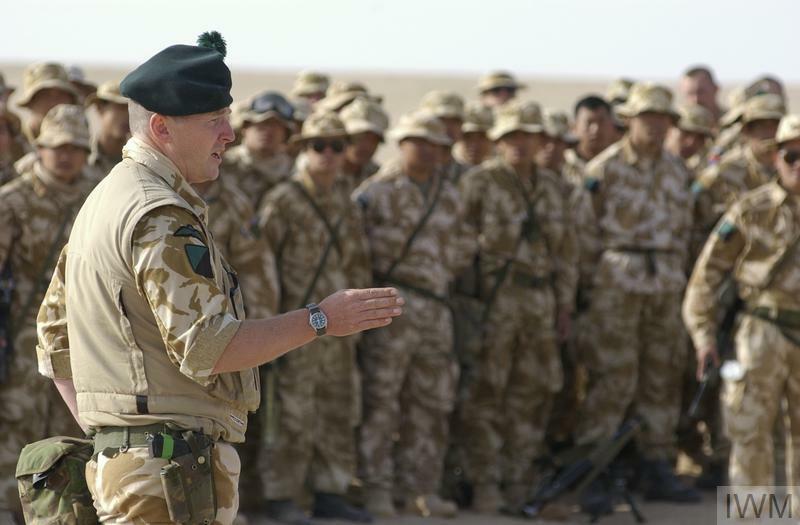 Lt Col Tim Collins, Commanding Officer of the 1st Battalion Royal Irish Regiment Battle Group, addresses his troops about the forthcoming campaign, 5 March 2003. The invasion, named Operation 'Telic' by the British, began with air strikes on Baghdad and an assault from the Persian Gulf on the Al-Faw peninsula to secure oil fields and key ports. As the land campaign progressed, many Coalition troops encountered fierce opposition. But by 9 April, US troops were in Baghdad - effectively ending Saddam Hussein's regime. On 1 May, US President George W Bush made a speech in which he declared the war over, saying: 'The battle of Iraq is one victory in a war on terror that began on September 11, 2001'. Looting in Baghdad and other major cities had destroyed much of the country's infrastructure and there was high unemployment – made worse by the disbandment of the previous regime's army. Across Iraq, the fighting continued as a violent insurgency developed. Coalition forces and Iraqis working with them were targeted. Large quantities of arms and ammunition had also been looted, further fuelling the insurgency. Counter insurgency operations in Basra, 2006. 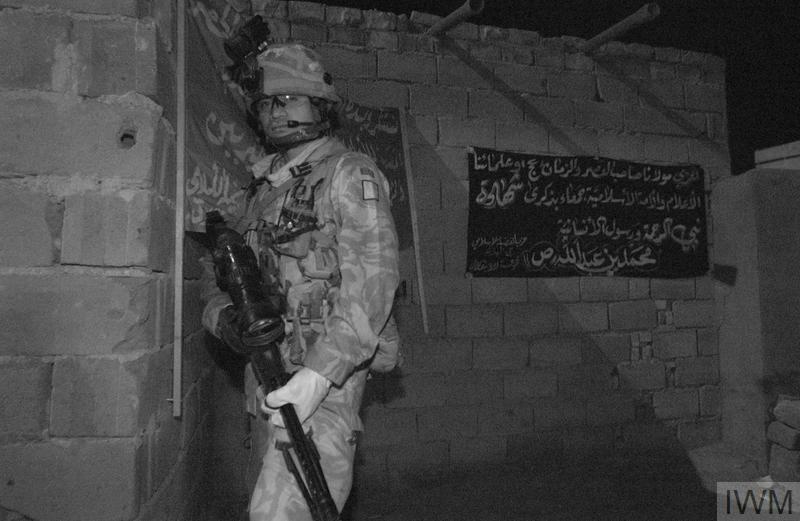 British soldiers, supported by other members of the Multi National Force, carry out a night search and arrest operation in a house in Basra City. The search revealed a cache of arms, ammunition and bombmaking equipment. Fourteen suspected insurgents were arrested. Thousands of Iraqi civilians were killed, injured or forced to leave their homes as the violence escalated, reaching its peak in 2006. By 2008, the situation had stabilised due partly to an increase of US troops. British combat troops were withdrawn in July 2009. US combat operations formally ended in August 2010. Between 2003 and 2009, there were 179 UK military deaths in Iraq. 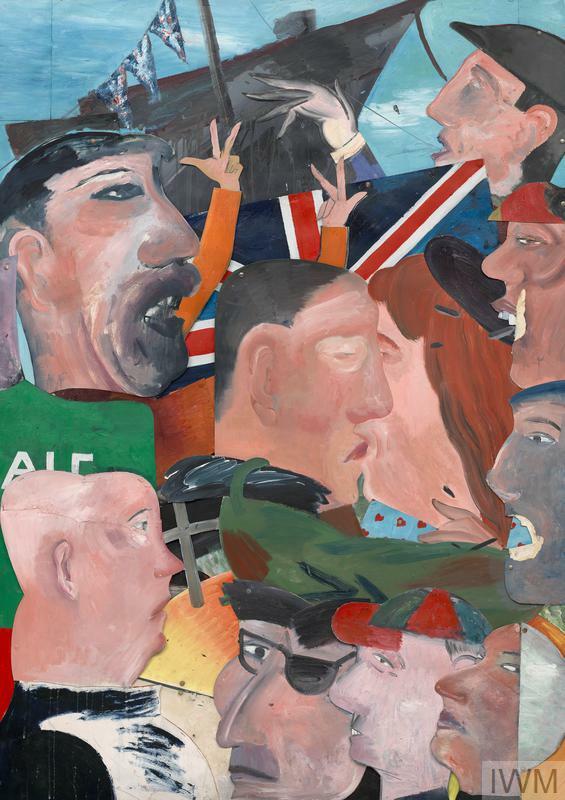 War, conflict and violence have been themes in John Keane’s work for 30 years. He was a war artist during the Gulf War in 1991 and has continued to explore these issues through his work in the years since that experience. With Singing Hearts and Throaty Roarings, 1983, by Jock McFadyen. © The artist. Since the mid 1970s IWM has collected and commissioned contemporary artists' personal, political and conceptual responses to conflict. This has resulted in a diverse and challenging collection of artwork, the highlights of which are brought together in a new book, Art from Contemporary Conflict.